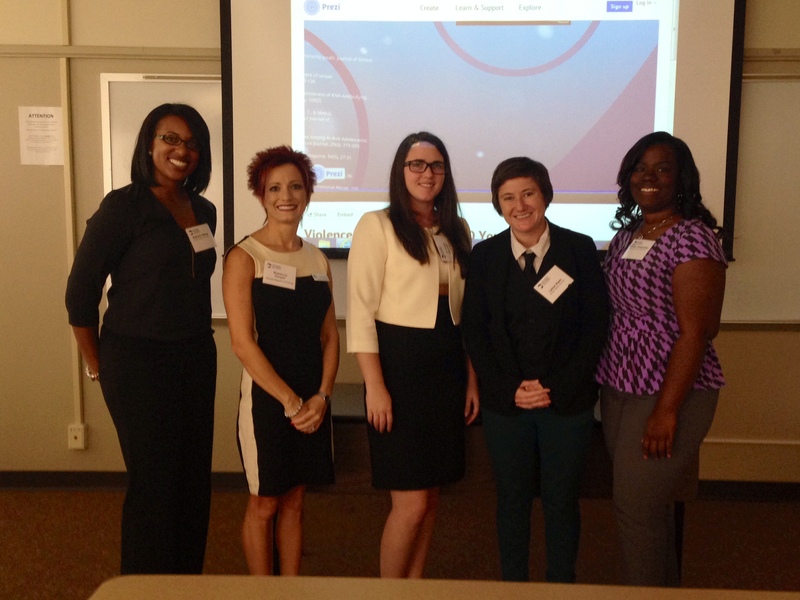 From L-R: Kamela Perry, Dr. Rebecca Harper, Amanda Bannister, Meaghan Laine Elam, and Nicole Carpenter. AUGUSTA, GA. – Four GRU College of Education students recently presented research with Dr. Rebecca Harper, after their work was accepted for a round table session at the 38th annual conference of the Georgia Educational Research Association. Alongside Dr. Harper, Amanda Bannister (Ed.S. ), Nicole Carpenter (Ed.S. ), Meaghan Laine Elam (M.A.T. ), and Kamela Perry (M.A.T.) presented a strategic action paper on ways for teachers in the classroom to deal with bullying. “Co-presenting research allows faculty to mentor students on dissemination and presentation aspects of the research process, which is part of being a scholar,” said Harper. She noted that conference officials were impressed with the GRU students’ work, none of whom had ever presented at a conference before. Their research presentation arose from the students’ work in EDTD 6950, Contemporary Issues in Education. To begin, the students brainstormed a list of current themes in education, which included accountability, testing, assessment, bullying, violence, and LGBTQ concerns. Out of the list, they chose to explore one of the class-generated topics: LGBTQ issues and bullying, and to develop ways to support teachers in dealing with bullying, even when they don’t support a LGBTQ student’s sexual orientation. That starts with recognizing that students may not associate exclusion, internet posts or verbal insults with bullying, because they equate bullying with violence and threats of violence. And it continues by engaging students in critical thinking exercises, like asking questions that challenge gender stereotypes. “It’s not necessarily about giving a stamp of approval; it’s about creating a safe environment for all students, regardless of background, beliefs, and sexual orientation,” Harper said.